One of the things I miss most about not writing a cookbook is making Korean meals that are just thrown together. The kind of Korean dishes Diane and I are most interested in are ones for which there aren’t really set recipes. It matters how salty your soy sauce or how sweet your cabbage is — it’s really hard to say you must include a tablespoon of this or a teaspoon of that. But I know people want guidance in a cookbook, even if it’s just that you start with a tablespoon and then add more to taste, which means I wield my measuring cups and spoons much more than I normally do. I also know that we’re dealing with the additional challenge of explaining unfamiliar ingredients to the non-Koreans we hope will buy this book. 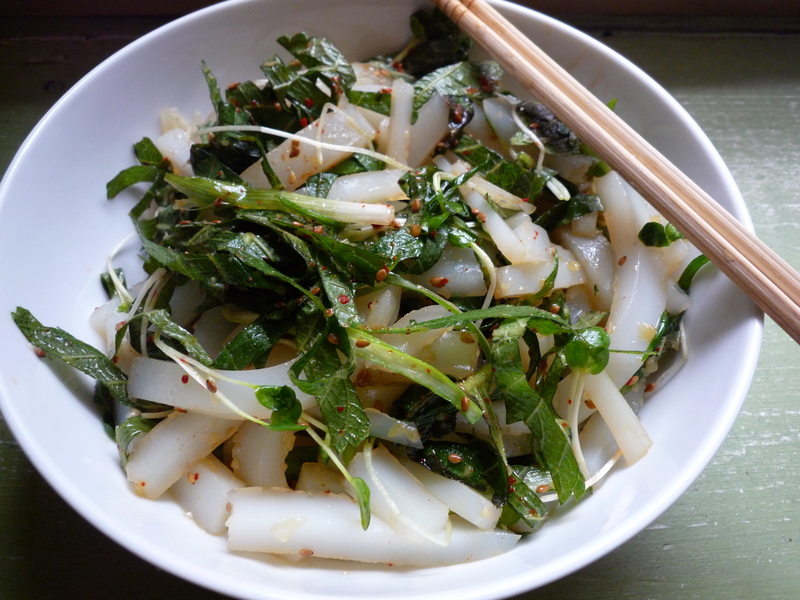 This lunch salad, though, was thrown together with leftover cheongpo-muk, a jelly made out of mung bean starch, and leftover perilla leaves, scallions, and sprouts. I drizzled some soy sauce and sesame oil, I sprinkled a big pinch of gochukaru or red pepper powder. It was really good. But I can’t tell you exactly how I made it. So how much guidance do you look for in a cookbook?